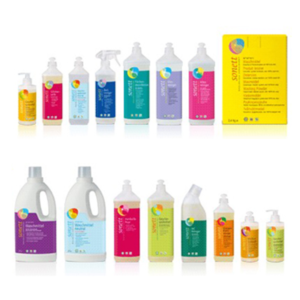 Sonett are a German company that produces a wide variety of ecologically sound cleaning products, and one of the best-selling ranges across Europe. They have recently won an award for being a ‘National Champion’ in the European business awards for their innovation, ethics and economic success. This is a company with seriously great eco-credentials, established behind the principle of caring for water, our most important resource. Sonett use no ingredients that could be environmentally hazardous or dangerous to human health, and all products are completely biodegradable and non-allergenic. All of the ingredients in the Sonett range are from vegetable and mineral materials, and many of the plant sources are grown using organic or even biodynamic methods. All Sonett products are free from artificial fragrances and colours, synthetic preservatives, enzymes, GM ingredients, phosphates and petrochemicals. Sonnet increasingly source their raw ingredients, particularly the high quality essential oils, with a guarantee that they have not been treated with artificial chemicals. Some of their oils are even fairly traded. The company actively works to counteract the intensification and increasing chemical use in today’s farming. The active washing ingredient in Sonett products is, for the most part, plant-derived soap. They avoid the ‘non-ionic surfactants’ used in some eco detergents as these ingredients are not in fact completely degradable. Sonnet also seeks to build a more inclusive society through various projects. The not-for-profit Sonett Foundation promotes initiatives in the field of water research and the development of alternative test methods to animal experimentation. Sonett website.